Witold Gordon was a Polish-born artist perhaps best known for his illustrations of regional architecture and typography, which were shown at New York’s Museum of Modern Art in the exhibition “American Scene” in 1941. New York’s idiosyncratic storefronts were the inspiration for a series of New Yorker covers in the 1940s. Shell Chest was Gordon’s only design for Associated American Artists, a collective whose founder, Reeves Lewenthal, believed in marketing fine art to the masses. In 1951, AAA collaborated with textile distributor Riverdale Fabrics to produce a line of artist-designed fabrics which were available both as yard goods and ready-made draperies, bedspreads, and pillows. The Pioneer Pathways collection of eight designs on Americana themes included Grant Wood’s The Ride of Paul Revere, Aaron Bohrad’s Country Auction, and Doris Lee’s Curio Cabinet. 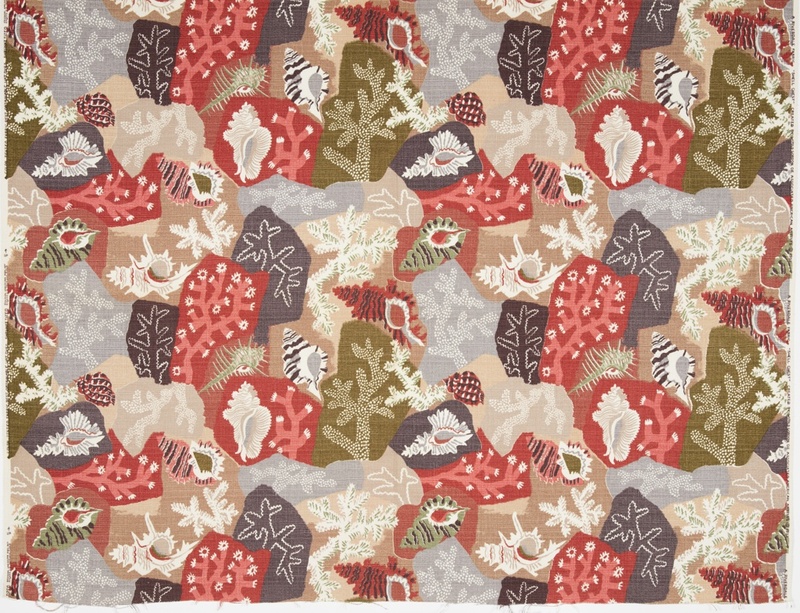 Gordon was no doubt chosen for his well-known renderings of American streetscapes, but uncharacteristically he created a pattern of scattered seashells and corals. Shell Chest was one of several designs from the Pioneer Pathways collection available with coordinated “Stonelain” ceramics. The collections launched at Macy’s in New York, showcased in interior settings. Gordon made appearances in the store to promote the products, which subsequently became available in over one hundred stores nationwide. At L.S. Ayres department store in Indianapolis, Shell Chest was displayed with an Eames Lounge Chair Wood, perhaps making a connection between the pattern’s natural forms and The Museum of Modern Art, New York’s Organic Design exhibition of 1941.